My goal for today was to finish piecing the Racetrack Quilt top, and I am happy to say that I had it done before 8pm. That certainly counts as a Friday Finish, right? As I was working on laying out the blocks earlier this week, I ended up making some changes in the fabric combinations for each block as compared to my initial layout in EQ5. My goal was to keep each of the 12 fabrics used once in the top two rows and once in the bottom two rows of the quilt, to have one print and one solid used in each block, to not use the same fabrics in two blocks, and to get a decent mix of light and dark across the quilt. Yeah, that’s a lot to think about, but in the end I am really happy with the way the quilt top came together. It is worth noting that my husband and I walked 7 miles today. We walked 4 miles round trip to get lunch downtown (I had half the blocks pieced before lunch), and then we took our typical 3 mile walk around our neighborhood in the evening (after 9 blocks were pieced together). There are not too many scraps left over from the fat quarters, either. Initially I thought there would be a 1.5 inch wide by 8 inch long strip of each fabric left over, but there is also a 3.5 inch wide by 3 to 6 inch long scrap of each fabric, too. Certainly not enough to make another quilt just from the scraps the way I was able to with left over fabric from Tessellated Leaves (Scrap Quilt, Groovy Scrap Quilt)! Linking up with TGIFF hosted this week by Val’s Quilting Studio and What I Did This Week (buttons to the right). Have you a quilting plan for this top? It should be very interesting to see! My quilting plan for today is to decide on a new project! I hope one comes through! I may start pillow tops if nothing big pops into my mind! 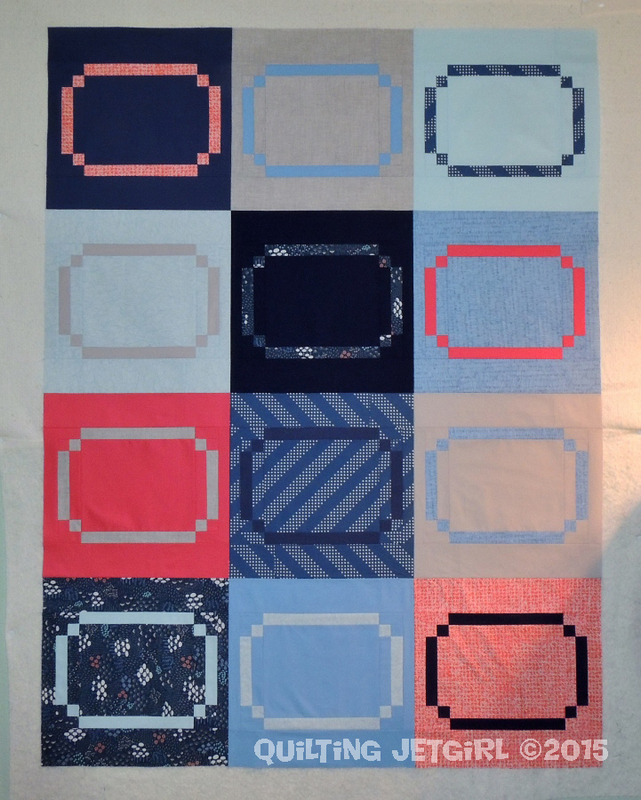 I would love to see a pic of your racetrack in the longarm, being quilted! Congrats on the finish. It looks great! I’m also glad to hear that I’m not the only one who tries to balance color, value, and prints with no repeat. It is a lot to keep track of. 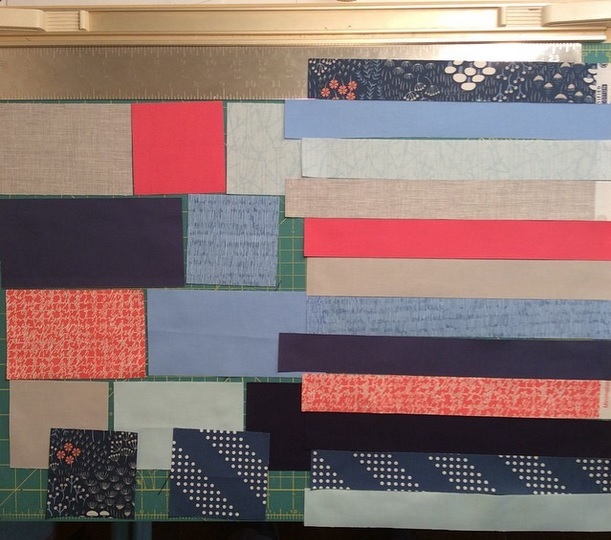 It looks great, I love how you mixed the prints and solids, can’t wait to see how you quilt it. Wow, you are a rockstar! All that walking and sewing? I think my right foot would fall off. 🙂 Good for you. I LOVE this design! Nice job hon!! I love it when I have JUST ENOUGH scraps left making a quilt top to piece something kind-of interesting to create a strip for a pieced back. I love stashing those little leftover bits until there’s a whole pile of them so I can use them to create a quilt (or two) that is a little reminder of a whole bunch of other quilts. This design reminds me of fancy picture frame shapes. Very interesting! Nice finish, that was quick! I love this color palette, the coral and blue just go together so well. It’s nice when you’re able to use up most of the fabric without too many awkward shaped scraps! Oh, this looks lovely! So modern, neat and clean! How about a pillow? is there enough to make something like that to go with it. Looking forward to seeing how you quilt it! I love and admire your productivity! The quilt top looks great! Looks great, your layout is beautifully balanced. This has turned out lovely and I still LOVE the idea! Can’t wait to see it quilted! Great job on the even light/darks and fabric combinations! I love that I am not the only one who seems to over analyze the fabric leftovers, colors, etc. It’s so much put into it before even beginning the quilt! Great job your speedy girl!